We’d love your help. Let us know what’s wrong with this preview of Scream by Stacy Jones. Grab a flashlight, close your closet door, and crawl under the covers with this chilling anthology filled with short stories and poems by some What fear steals your breath and leaves your bones shaking? To ask other readers questions about Scream, please sign up. I like that these are actual fears of these authors that have been twisted. Most of them are rather chilling, especially if it's your fear that's been twisted. I'm not respond find of the poetry, but that's just me. Reader beware, my fear is snakes and I'm pretty sure I'll have nightmares if I sleep tonight. Well written. I really enjoyed this book. You get stories from multiple authors so you get different takes and writing styles. I also love the fear aspect of it, each authors fear being twisted by someone else. We all have something we are scared of but to see it in writing in chilling. Take note, some of these are clips of ongoing stories, and some are poems. Not so much horror as they are chilling. The authors do a phenomenal job of creating works filled with dark emotion. These stories are not for the faint of heart. They are filled with your worst fears and the terrible emotions you experience: anxiety, fear of death or loneliness - which may be a trigger for some. Truly, the raw emotions the authors write are projected onto the reader. Brilliantly done! Ok so idk honestly they are just snippets of what's so come not really something I would pay for but I suppose if I want to read little snippets of books from it favorite authors that's to come this is good to get like also if u don't have time to read whole book right now and are looking h for something in the future that might spike it fancy then these types of things r good. This is an interesting collection of short stories and poems from some talented authors. Each one begins with a beautiful illustration that is unique to the story or poem you are reading at that time. I think my favorite though was Noise. I'm not usually into poems but this was very good and the stories really touch on things that you are more than likely truly terrified of maybe even in your subconscious. Well this was unexpected I must say! I really wasn't sure if it would be my sort of thing but I went into it with an open mind and I'm not sorry I did. This anthology is so different from what I've read before showcasing these brilliant authors different styles and abilities through expounding on their own fears...genius. Even if you think...bah I'm not into poems, or nah I prefer sinking my teeth into a good long plot I suggest you give it a chance, you won't be disappointed. 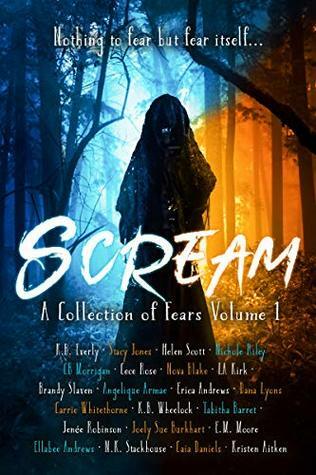 Scream: A Collection of Fears Anthology is not something I would have thought I would enjoy (I never read horror, I am such a scaredy cat and don't even watch horror movies!!). I enjoyed this collection of stories and poems, loved the mix of horror, fear, and emotionally passages. I was pleasantly surprised to see such different work from authors that I normally read. Will be finishing this up over the holidays but liked the stories I have read so far! A collection of short stories and poems. Not particularly scary, though i don’t think that is what they were necessarily going for, some people who suffer from some of these “fears” may find it hard to read. I personally am not a big fan of short snippets, I could see where some of them could be expounded upon and made part of a bigger story which would appeal much more to me so these act like readers in a way. The poetry was by far my favorite part. So I’m not normally one to read short stories or poems, but this book was great. I didn’t find it so much as scary but more chilling and can give you goosebumps. I love how the authors brought the feats to life. I was worried I wouldn’t be able to finish this book but as soon as I started it I knew I wouldn’t be able to put it down. Going into all this I was a little worried I wasn't going to like this since I am not really a fan of horror and I am not that into poetry but I gave it a chance anyway and was pleasantly surprised. These short stories and poems were very well written and attention snatching. I suggest reading at night as I did just to add to the creepy factor. Excellent collection! I really liked how it was laid out with the poems in between the short stories. These are great little reads with just enough to make you want more and a couple of goosebumps as well. I now have quite a few new authors to add to my TBR, and possibly some new fears I didn't even know I had lol! This is my first anthology and I wasn't sure what to expect but I enjoyed it. I really liked the idea of each author writing about a specific fear and very much giving life to it. It really draws you in: Fears you may have experienced and some you may not have even thought of. Each story/poem is descriptive and you feel the fear along with the narrator. What a great collection of short stories and poems!! I really enjoyed getting a glimpse of different authors, as well as this anthology as I had never read one like this before. I loved it, and would definitely read another one. This is perfect for around Halloween time or just if you are feeling like you need a chill or two. This is an amazing collections of short stories and poems by many amazing authors. This is great if you are looking for something to read and you don't have a lot of time. These stories are unique to each author and I highly recommend reading this today if you want to get a feel for the authors individual books. You won't go wrong with this anthology. I was not expecting just how amazing this collection would be. Seriously. I normally like to use anthologies as a way to be introduced to new authors, but this was different. Each story was unique and held my attention, and they were down right, spine tingling, creepy. I love how each fear was showcase in the lens of the author! I’m not a huge fan of anthologies but this one had a great array of talent mixing short stories and poetry. I was incredibly impressed and plan on checking out all of these authors. If you’re looking for something different and have a fascination for creepy this will surely have your hair standing on edge. I definitely recommend this! This anthology took my breath away! Poems so powerful they leave you reeling...raw stories that aren’t about boogie men but instead ones that pull your greatest fears from your mind and put them on paper! This anthology, literally, brings fear to life! I'm not a huge horror fan but I am a huge fan for these horror stories. Some of these fears I've never even thought about being scared of and some are already a fear of my own. These authors did a fantastic job in this spooky and thrilling anthology. Great job! This book.....jezz. Wow, okay. Yeah that was amazing. I love that it's a mix of the short stories and poems. Admittedly I've always loved poems a little bit more, but I like how the fears are give an almost personality and make you feel what the author felt, at least while writing it. I loved this anthology it was frightening wicked read. I love how all the authors combined these fears and twisted them into their own masterpieces. This collection was a great fun read and perfect for the holiday, plus you get a little inside some of your favorite authors fears! Jesus. These are so well written and chilling/emotional/oh my God all the feels. I cant even pick a favorite story. The fears are all different. The stories and poems are all incredible. Like goosebumps kind of yes give me more. I'm still at a loss for words here on what to write. Such a unique idea. These authors are not only telling short stories and poems about fears, but they are using their own fears! It’s spooky with a side of creepy with a special look at each author. Really enjoyed it. This book was interesting, I wasn't sure how I would take to it but it really surprised me. Each story and poem pulled you in some sad, some just creepy. All around great read from some of my favorite authors. I loved this anthology. It introduced me to new authors that I hadn't heard of before. I have read K.B. Everly before and loved her story on this. This is a collection of short stories and poems. It is a great horror read. This was such a great antho. But how could it not be with such a great collection of authors. I loved the stories that were contained in this book. It’s definitely a must read for everyone!! Great collection of spooky stories from a great group of author's. Based on your greatest fears, so may contain some triggers for some.